I suspect that most of you will depend on your smartphone mobile device to communicate, connect and even possibly navigate while in Hannover for DOMOTEX 2011. That's certainly what I'll be doing and I think you'll find the following mobile related information valuable... It relates to mobile tools and connecting via #domotex. For those of you using Twitter, save a search on your smartphone Twitter client for #domotex. That will allow you to keep abreast of announcements and conversations taking place during DOMOTEX - including any last minute Tweetups. My Twitter handle is @thedomotex. Exciting news from DOMOTEX to help you navigate the world's largest floor covering trade show and event: DOMOTEX2go. Perhaps you noticed the status update on Facebook about it. 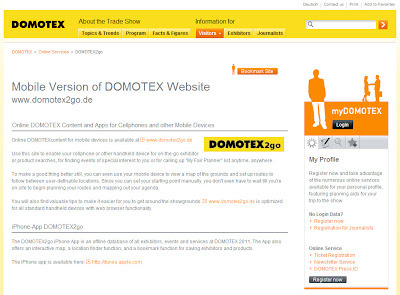 I recommend that you install DOMOTEX2go now on your smartphone and consider bookmarking before you are in Hannover those products, exhibitors and talks that you want to make sure you have time for and visit. By the way, definitely explore DOMOTEX2go on your desktop. You'll notice maps, and listings of products, exhibitors, talks. If there's something of interest, you can bookmark it and the application will calculate how to get to that location! Priceless if you've spent any time trying to negotiate and navigate through DOMOTEX Hannover's 13 exhibit halls. Note for the iPhone: the application requires version 4.01 of the iPhone software. 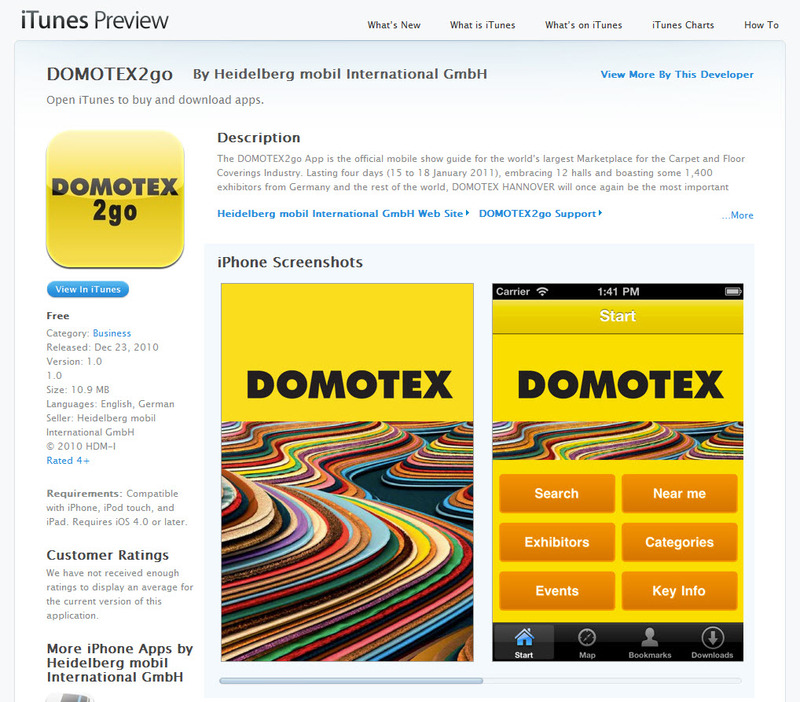 The image below shows you the DOMOTEX2go app. I look forward to connecting with you while at DOMOTEX and hope you find these tools helpful.